AHA's Members in Action series highlights how hospitals and health systems are implementing new value-based strategies to improve health care affordability. This includes work to redesign the delivery system, manage risk and new payment models, improve quality and outcomes, and implement operational solutions. 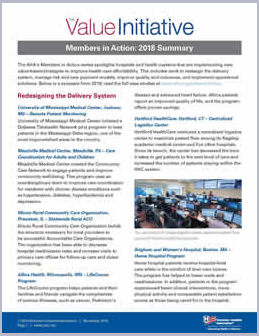 Click on the categories below to learn how AHA members have used these strategies to improve quality and decrease health care costs.